1. The story of the Seven Sleepers has been adopted, and adorned, by the nations, from Bengal to Africa, who profess the Mahometan religion; and some vestiges of a similar tradition have been discovered in the remote extremities of Scandinavia. This easy and universal belief, so expressive of the sense of mankind, may be ascribed to the genuine merit of the fable itself. We imperceptibly advance from youth to age, without observing the gradual, but incessant, change of human affairs, and, even in our larger experiences of history, the imagination is accustomed, by a perpetual series of causes and effects, to unite the most distant revolutions. But, if the interval between two memorable eras could be instantly annihilated; if it were possible, after a momentary slumber of two hundred years, to display the new world to the eyes of a spectator, who still retained a lively and recent impression of the old; his surprise and his reflections would furnish the pleasing subject of a philosophical romance. The scene could not be more advantageously placed than in the two centuries which elapsed between the reigns of Decius and of Theodosius the younger. During this period, the seat of government had been transported from Rome to a new city on the banks of the Thracian Bosphorus; and the abuse of military spirit had been suppressed by an artificial system of tame and ceremonious servitude. The throne of the persecuting Decius was filled by a succession of Christian and orthodox princes, who had extirpated the fabulous gods of antiquity; and the public devotion of the age was impatient to exalt the saints and martyrs of the Catholic church on the altars of Diana and Hercules. The union of the Roman empire was dissolved; its genius was humbled in the dust; and armies of unknown Barbarians, issuing from the frozen regions of the North, had established their victorious reign over the fairest provinces of Europe and Africa. Edward Gibbon, The History of the Decline and Fall of the Roman Empire, vol. 3. 2. 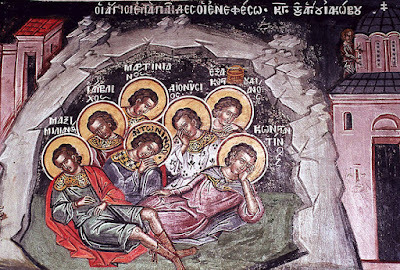 I wish that I had been one of the Seven Sleepers of Ephesus. These Christian brothers had been walled up in a cave in the middle of the third century, during the pagan persecution of the Emperor Decius (249-251). They were awakened in the early fifth century, in the reign of Decius' direct successor, the Emperor Theodosius II (408-450), in order to enlighten that most Christian monarch on a point concerning the resurrection of the dead. Imagine their surprise when, on entering the city, they saw the Cross placed above the main gate, heard men freely swearing by the name of Christ, saw a great church and the Christian clergy busied with repairing the walls of the city, and found that the solid silver coins of a pagan emperor caused amazement in the marketp1ace. This book is an attempt to enter into their surprise. Hence the title - The Making of Late Antiquity. I wish to trace in the late second, third, and early fourth centuries the emergence of features that were far from clearly discernible at the time when our Christian brothers entered the cave and which finally came together to form the definitively Late Antique style of religious, cultural, and social life that emerged in the late fourth and early fifth centuries. Peter Brown, The Making of Late Antiquity, Ch. 1 "A Debate on the Holy", p. 1.